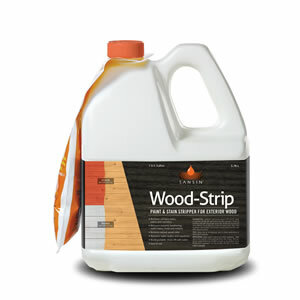 Wood-Strip: Effectively removes old paint and stain coatings. Effectively removes old paint and stain coatings. Sansin Wood-Strip is a superior stripper that easily removes oil and latex stain and paint coatings. Simply spray on the desired surface and Wood-Strip begins to penetrate and attack the coating immediately. It removes extreme weathering, water stains, mold and mildew, while restoring the natural color of wood. Sansin Wood-Strip is biodegradable, rinses off with water and works fast. Recommended for use on coated new and old wood surfaces such as decks, fences, siding, logs, board and batten, and timbers. Wood-Strip is available in industrial concentrations for large projects. View the Wood-Strip Product Data Sheet (PDF) for information about application, preparation, maintenance, and more. View the Wood-Strip Safety Data Sheet (PDF). Sansin Classic: Specially engineered for log and timber-frame structures. Sansin Eco2: Environmentally-friendly recycled wood finish. Sansin Wood Lightener: Effective wood lightener for bare wood surfaces. Sansin Purity Clear: A two-coat finish that enhances the natural warmth of wood.